In order to sort data inside a range in VBA, you have to use the following code. This code will give you the following result. There are few elements inside this code that require explanation. Key – Here, you have to specify which column you want to sort. 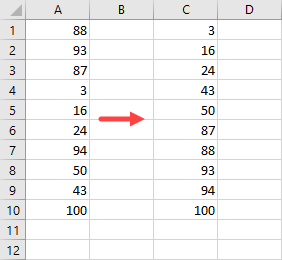 If you want to sort column A, you have to apply a cell inside this column, eg. A1. 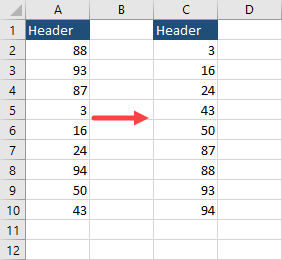 Order – You can specify here whether you want to sort values in an ascending or descending order. We sort in ascending order by providing order1:=xlAscending. 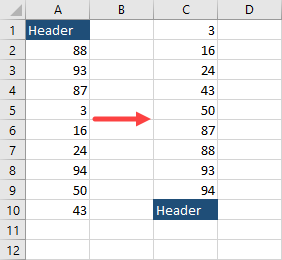 Header – We can specify here whether our range has headers. Because our data has only values, we specified that we don’t use header – Header:=xlNo. In the earlier example, we specified that we don’t use the header. Let’s take a look at our example, this time with a header. If we sort it in an ascending order we are going to get something like this. This is definitely not what we want. But we can do a slight modification to our code and specify that we want to use the header. Now, we get what we wanted – the table is sorted and the header is in its place. 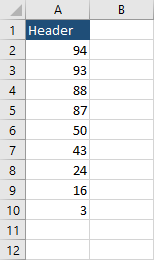 You can also sort the data from the largest to the lowest value by using the following code.